An advance by the University of California Los Angeles (UCLA) neuroscientists could lead to a better understanding of astrocytes, the star-shaped brain cells believed to play a key role in degenerative neurological diseases. Reported in Neuron, the new method enables researchers to peer deep inside a mouse's brain and watch astrocytes' influence nerve-cell communication in real time. 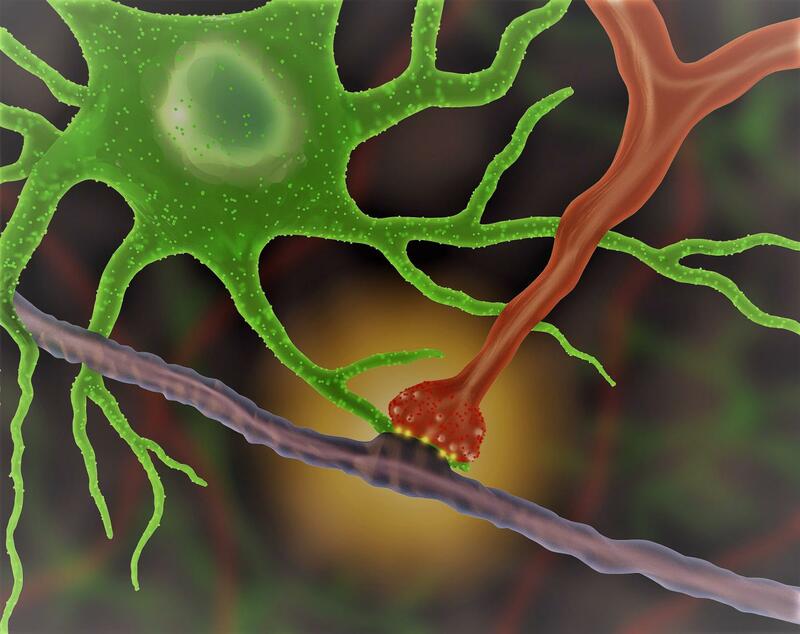 In particular, the UCLA team focused on astrocytes' relationship with synapses, the junctions between neurons that enables neurons to signal each other and convey messages across predictable distances. "We're now able to see how astrocytes and synapses make physical contact, and determine how these connections change in disorders like Alzheimer's and Huntington's disease," said lead author Baljit Khakh, a professor of physiology and neurobiology at the David Geffen School of Medicine at UCLA. "What we learn could open up new strategies for treating those diseases, for example, by identifying cellular interactions that support normal brain function." Neuroscientists have tried for years to measure how astrocytes' tentacles interact with synapses to perform important brain functions. Until now, however, no one could develop a test suitable for viewing adult brain tissue in living mice. In this method created by Khakh's team, different colors of light pass through a lens to magnify objects that are invisible to the naked eye and far smaller than those viewable by earlier techniques. It allows them to observe in mouse models, how interactions between synapses and astrocytes change over time and during various diseases. First author Chris Octeau, a postdoctoral fellow of physiology in Khakh's lab: "We know that astrocytes play a major role in how the brain works and also influence disease. But exactly how the cells accomplish these tasks has remained murky." 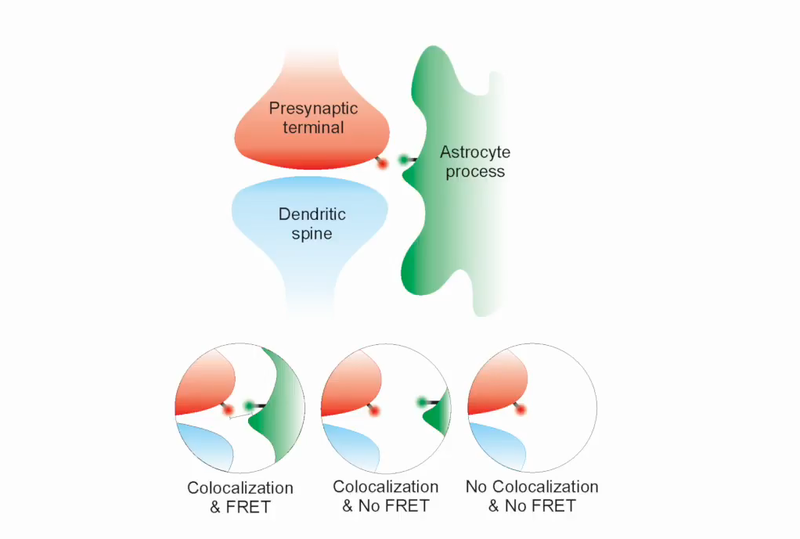 It is unclear how often astrocytes make contact with synapses and how these interactions change during disease or as a result of different types of cellular activity. However, the UCLA advance provides a powerful tool that scientists can use to address these questions. "This new tool makes possible experiments that we have been wanting to perform for many years," said Khakh, a member of the UCLA Brain Research Institute. "For example, we can now observe how brain damage alters the way that astrocytes interact with neurons and develop strategies to address these changes." Astrocytes are complex bushy cells that serve important functions through close contacts between their processes and synapses. However, the spatial interactions and dynamics of astrocyte processes relative to synapses have proven problematic to study in adult living brain tissue. Here, we report a genetically targeted neuron-astrocyte proximity assay (NAPA) to measure astrocyte-synapse spatial interactions within intact brain preparations and at synaptic distance scales. The method exploits resonance energy transfer between extracellularly displayed fluorescent proteins targeted to synapses and astrocyte processes. We validated the method in the striatal microcircuitry following in vivo expression. We determined the proximity of striatal astrocyte processes to distinct neuronal input pathways, to D1 and D2 medium spiny neuron synapses, and we evaluated how astrocyte-to-excitatory synapse proximity changed following cortical afferent stimulation, during ischemia and in a model of Huntington’s disease. NAPA provides a simple approach to measure astrocyte-synapse spatial interactions in a variety of experimental scenarios. The study was supported by grants from the National Institute of Neurological Diseases and Stroke, the National Institute of Mental Health and the National Institutes of Health Director's Pioneer Award. An astrocyte (green) interacts with a synapse (red), producing an optical signal (yellow). Image credit: UCLA Baljit S. Khakh Laboratory. Be sure to watch the VIDEO of these processes.